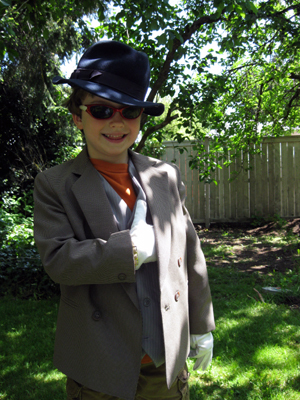 In preparation for this weekends Lego Agent themed party, we scored the shirt, vest, jacket and gloves at a 50% Memorial Day sale at Value Village> Thanks to the tip we got on fcbk. We’ve been working on secret agent jokes and lego jokes. That’s NOT the secret knock!! Posted on May 26, 2009, in Apparel, SON. Bookmark the permalink. Leave a comment.